With extensive rise in the global geriatric population, the deployment of various devices and equipment addressing the several issues of the aging population is also increasing. Moreover, the growing per capita income of the consumers in developed as well as developing regions has triggered the use of several advanced devices for the treatment of a wide range of diseases. Manufacturers of nebulizer devices are expected to witness a shift in the pricing as the production shifts to emerging economies. The shifting production of nebulizer devices can be attributed to the easy and cheap availability of land in developing regions. For instance, Koninklijke Philips N.V., Becton, and Dickinson and Company and several other companies have set up their manufacturing plants in India. Several other companies are looking forward to open their manufacturing plants in developing regions. The North America nebulizer devices market is growing with every passing day through continuous innovation in technology. As the population in the region follows a fast moving lifestyle, patients are looking for more portable nebulizer devices that can be transferred easily in time of need for patients suffering from asthma and other airway or lung diseases (bronchitis and pneumonia). 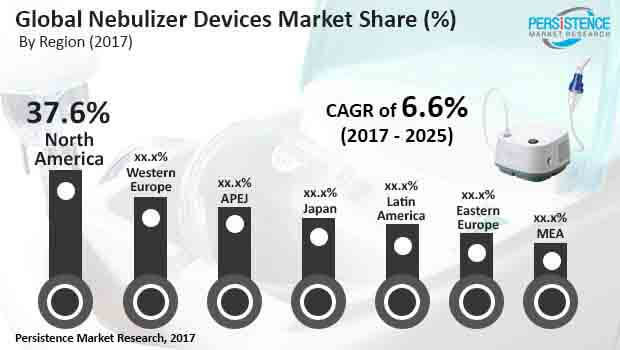 The adoption of newly launched nebulizers with quick drug delivery coupled with high-end technological assessment with greater accuracy is gaining traction amidst the U.S. population, hence supplementing the growth of the global nebulizer devices market. For instance, Omron Healthcare, Inc. launched the Portable MicroAir Nebulizer device that is packed with super small nebulizers having VibratingMesh Technology and weighs 6 oz and fits discreetly in one’s palm. Taking a cue from this, market companies are developing portable devices that can be used by newborns suffering from various respiration problems such as COPD (Chronic Obstructive Pulmonary Disease), asthma, and others. Nebulizer devices are powered with rechargeable batteries and several different types of masks are also available for use in neonatal cases. The growing prevalence of chronic obstructive pulmonary disease or COPD in Asia Pacific has intensified the use of nebulizer devices in the region. Chronic obstructive pulmonary disease is a term used to describe a chronic progressive condition of lung disorders such as asthma and chronic bronchitis. As per the Journal of Thoracic Disease, the prevalence rate of COPD cases in China is 8.2% and is related to the increase in exposure to biomass smoke. According to the Journal of Lung, Pulmonary & Respiratory Research, it is estimated that there are 5 lakh deaths in India every year due to COPD. According to the World Health Organization, COPD prevalence in New Zealand is between 10% and 17% of the total population. According to the Lung Foundation Australia, 7.5% of Australians above 40 years of age suffer from COPD. Moreover, the growing disposable income of consumers in the region allows them to afford more advanced technologies and adopt better treatment options. As a result, the demand for nebulizer devices in the APEJ region is expected to intensify over the coming years.